Just from wording, that 9 km would be "assured acquisition of enemy ships", which would get boosted by TASM 1. And I think I read radar basically extents this hard spotting distance for the ship that radars, which is why it can see beyond 8 km in cyclones. I haven't tested it though and maybe others have. Does it affect radar/hydro or no? Do we have conclusive proof? On the one hand, 13.5 km radar suddenly would be silly, but on the other hand, I wouldn't doubt WG to not have left the door open. Just, I doubt players never figured it out. TASM1 stacks only with torpedo spotting of hydro. Ship spotting ranges of hydro and radar are absolutely fixed. TASM1 doesn't extends Radar and Hydro ship detection ranges. 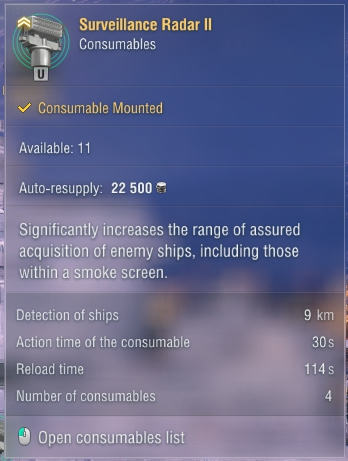 The "Assured Acquisition" range is 2km for all ships. Having TASM1 extends that range from 2 to 3 km. Not sure if affects the torpedo acquisition of Hydro (I've checked the wiki and doesn't seems to stack). However, it stacks with Vigilance and also Vigilance stacks with Hydro for torpedo detectability, so hope someone with more knowledge can provide more light with torp spotting ranges. EDIT: @Commander_Cornflakes answered the torp detection thing. Yeah, pretty much what I thought. Just thought maybe someone knew a source or had tested it. Thanks for responses though. It'd make TASM1 actually worthwhile in builds and one could argue about options, as for example Cleveland with 9.1 or so concealment and 9 km radar is obviously stronger alround, but Cleveland would still be playable at 10 something km concealment, but with 13.5 km radar in return. 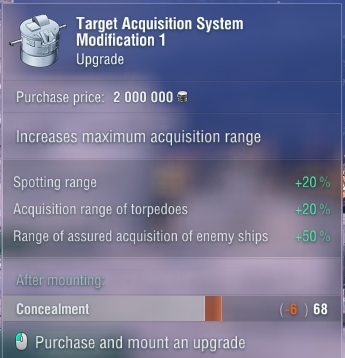 I considered the whle matter due to the changes to CE, which will nerf my Edinburgh to 9.2 km concealment and create a 200 m window where I cannot counter-radar. Which makes me sad. Naturally, there'd be clear victims to such an indirect radar range buff and it'd be silly as hell, especially on Russians, as you pointed out. 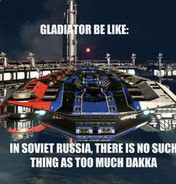 It would actually be interesting, since the Russian CAs are balanced by the fact that hardbass that they play on the ships can be heard from the next continent even with CE mod, so would actually be a interesting trade off if TASM1 actually stacked. Trading your own concealment for a better radar would indeed be an interesting tradeoff. It'd be interesting, though it would need a reduction to like 20-25% range increase max. Even then it'd be incredibly strong. The issue I see really is that the change from a game balance perspective is not needed and has too many side effects just to make TASM1 an option worth considering instead of CSM1. At this point WG could take out TASM1 and just leave the choice of CSM1 and SGM3. Nothing of value would be lost. 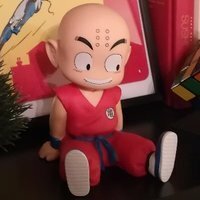 So, making it useful would be nice.